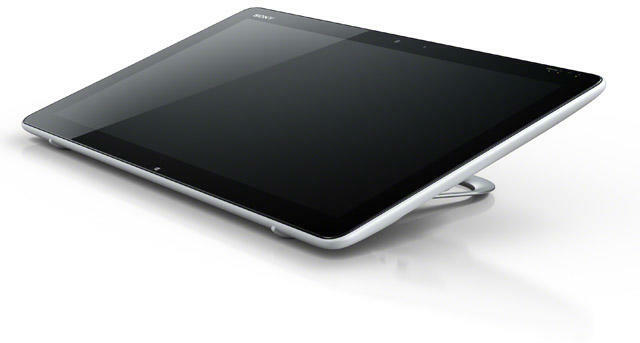 The Sony VAIO Tap 20 will let you enjoy Windows 8 in multiple angles and in all-in-one convenience. With the touchscreen interface in Windows 8, there are going to be a host of new computing scenarios, and the VAIO Tap 20 seems to take a lot of those into consideration. One of the biggest concerns we’ve heard from consumers is how tiresome it may get to use a touchscreen when arranged like a standard monitor, but the Tap 20 will lay down into an angled position when you want to get your touch on. And with 10 point reading, it would be great for kids to gather around and play games. We expect to see a lot of new computer designs with Windows 8 just around the corner, and this one definitely shows some promise. Now everyone can share exciting media experiences with VAIOTM Tap 20 from Sony. It’s the fresh concept in home computing that’s a tabletop PC and so much more. Versatile VAIOTM Tap 20 is designed to leverage the intuitive ease of Windows 8, opening up exciting new possibilities to interact with apps and your media collection. Portable, battery-powered VAIOTM Tap 20 fits right into any living space – from bedrooms and kids’ play areas to the kitchen or garden. Lay it on a coffee table and let everyone join in games on the large multi-touch screen. Flip out the in-built stand and tilt VAIOTM Tap 20 at a comfortable angle for ‘lean back’ photo/movie editing by touch operation, browsing and entertainment. Or stand it upright and use as a fully-functioning desktop PC: it’s easy to work on documents, surf or check emails with the supplied wireless keyboard and mouse. The 50.8 cm (20”) panel offers clear, bright images with a wide angle of view. Responsive 10-point multi-touch operation lets all the family join in simultaneously with multi-player games. Mobile BRAVIA Engine 2 by Sony ensures crisp, natural movie viewing with fine details and fluid on-screen movement. Step up to rich, powerful audio that’s a revelation after the small, weak speakers of ordinary laptops. Generously-sized stereo speakers are partnered by an on-board subwoofer that boosts low frequencies for solid, thumping bass. S-Force Front Surround 3D technologies by Sony ensure a vibrant, room-filling soundtrack – whether you’re playing games together or watching movies. Incorporating several of Sony’s own signal processing technologies, ClearAudio+ mode lets you effortlessly enjoy audio quality that’s distinctly Sony. With one simple operation, you’ll experience sound with ultimate clarity and presence across a wide audio spectrum, from deep lows to crisp highs. VAIOTM Tap 20 comes with a choice of apps that are optimised for the powerful multi-touch capabilities. Family Paint lets two people draw, paint, sketch and daub simultaneously from opposite sides of the large multi-touch screen. Share the results at a touch on Facebook or Twitter. Fingertapps Organizer makes child’s play of keeping everyone’s agenda up to date. The friendly calendar view lets family members add sticky notes, scribble notes and see at a glance what everyone else is up to. VAIOTM Tap 20 makes it easier than ever to connect with other home devices and share your content. The ‘Music’ application lets you enjoy your music collection with superb quality thanks to ClearAudio+ mode. Optional accessories for VAIOTM Tap 20 include a LCD protection sheet that safeguards the large touch screen against fingerprints and occasional scratches. It’s easy to apply without causing unwanted trapped air bubbles.